Toronto ON., July 7, 2009 – On July 18th, ROOTS Canada invites the public to hear artist Franke James discuss her new illustrated book, Bothered by My Green Conscience, and get inspired to ‘do the hardest thing first’ for the planet. Franke James will read a visual essay from her book, and talk about our “green conscience.” Illustrations from her book will be on display. Location:ROOTS 100 Bloor Street West, Toronto, Ontario. 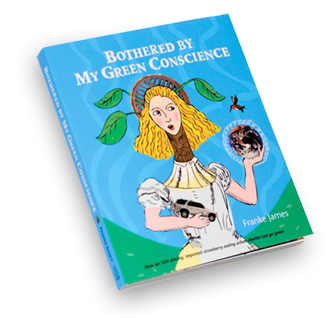 Bothered by My Green Conscience is the story of Franke James true-life adventures in going green. It includes the story of her selling the family’s only car (an SUV) and the reactions of her family (her brother-in-law called her a ‘tree-hugging whack job!’); winning approval from Toronto City Hall for the right to build a green driveway (and actually building it as a long weekend DIY project); rediscovering eccentric glamour in her own closet; understanding the real poop on social change; and also writing a visual letter to her future Grandkids in 2020 as she wonders how they will judge us. Franke James is an artist and writer focused on the environment. James’ visual essays have been featured in major Canadian newspapers, and online sites such as Treehugger. James has an MFA from University of Victoria and a BFA from Mount Allison. She lives in Toronto. See book reviews. ROOTS is Canada’s leading lifestyle brand known around the world for its quality leather goods, apparel, accessories and home furnishings. 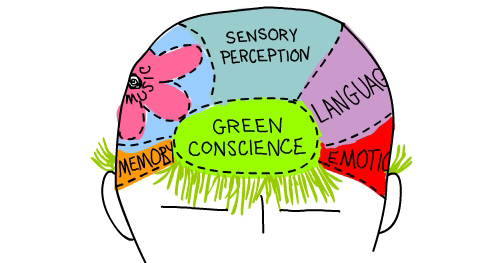 Green is more than just the official colour of Roots. It also reflects the company’s longtime environmental commitment, which includes making sustainable products; using recycled, reclaimed and non-toxic materials in the building of stores; supporting various environmental organizations and related projects.